Giant ragweed; click for greater detail. In contrast to yesterday’s picture, giant ragweed can sometimes look less linear and more scraggly, especially at the top, as seen here on another plant growing at the same site as the one in the previous post. For more information about Ambrosia trifida, including a clickable map showing the great many places in North America where the plant thrives, you may follow the siren’s song to the USDA website. Great blog, love the photos. I’m glad you find the photos photogenic. Thanks for your like at such a late date. This post was three months into the existence of the blog, and not many people were visiting in those early days. 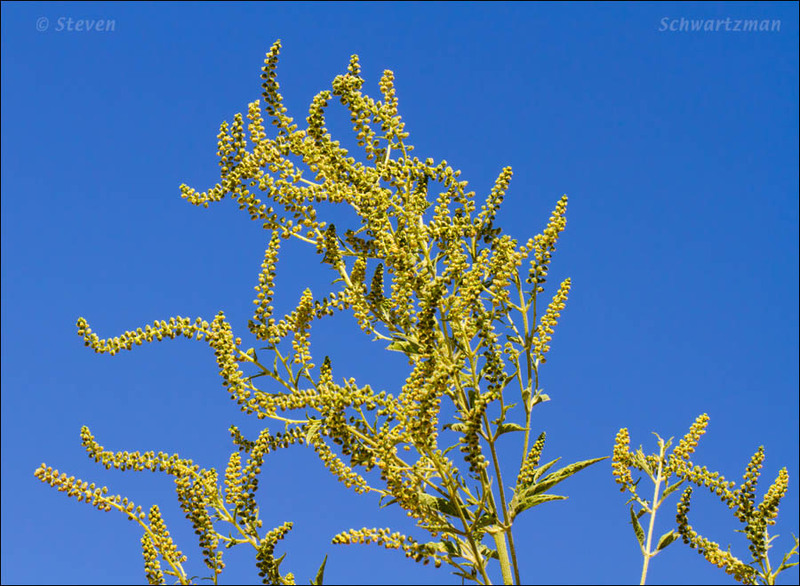 In addition, ragweed is a subject that most people have a hard time liking (in the traditional sense of the word like), and inconspicuous flowers of this type don’t appeal to many either. Since I learned about sinus rinsing (hence, goodbye to seasonal allergies), I am one of the *only* people who might like ragweed. Three months in. That explains it. BTW, I just posted a link to that almanac download (you’ve been thanked in it). That was a great share! I’m nearly 200 pages in it so far. Good for you. I’ve heard of that but haven’t tried it. I suffer from ragweed and sumpweed, but that hasn’t stopped me from wading in in the fall to take my pictures.